Is there any value in teaching goto statement or flowcharts? I was recently reading a new, and mostly excellent, magazine Hello, World. There is an article on teaching goto. The author states that there is value in teaching goto, as it helps to translate flowcharts into code. I have always considered goto to be harmful. It results in code that is buggy and hard to read. Not just because I read it in a 1960 paper “Go To Statement Considered Harmful“ — Edsger W. Dijkstra, but because it is self evident (once you have tried structured-programming). I have always considered flow-charts the same way. They are just the pictorial form of unstructured code (The UML of assembly language). Does the author have a point? Is there some value in goto or flow-charts? Flowcharts are visual, but there are visual structured representations that are better. goto can/has-to be used in teaching assembly language/machine code. If you are teaching assembly code or maybe Fortran then probably you need to discuss goto and possibly flow charts. However, if you are teaching a modern high level language, even something as old as Pascal, you should probably avoid them other than as an historic curiosity. This was settled almost 50 years ago, actually. Along with some other illuminati of CS, David Gries has always used the term "flaw chart" for the classic diagraming technique. It is too easy with such tools to create unmaintainable code. There is a form of Structured Flow Chart, however, which is not much different from, say, Pascal. It has no arrows, but, basically, only containment and sequencing of structures. But even that is probably just a waste of time as the constructs of modern languages make it unnecessary. Even if you are programming in a language that requires goto however, you should probably only use structures like if-then and while-do that have been proven to be sufficient and also result in better (maintainable, understandable) code. Just Say No. On the other hand, there is one reason for teaching goto to students of modern languages. If those languages permit goto then eventually the student will need to read programs that contain them even if they don't write such programs. So, purely as a defensive measure, they should know how to interpret these programs even as they disparage the authors of those programs. There is a story from the past that is illuminating. In the old days IBM had a company policy that every program had to be documented with flow charts. However, they also had a tool that would create a flow chart from a Fortran program. So, the program was written, then the tool produced its flow chart, often spread over many, many pages. But the policy was satisfied. But, as a design tool, no. I am the author of the article. The point is to simplify the model of computation, not to match flow charts. This is for mixed-ability 12 year olds, and when I say mixed, I mean some still add single digit numbers using their fingers. Flow charts work because you can easily jump to another point in the program. This is not software engineering. I want them to create software where they understand how it works. Goto also more closely mirrors the processor: it's easier to describe how programs are translated. After all, there is no such thing as structured programming at machine code level. Dijkstra's article is a polemic from a purist. There were dissenting views at the time, which gave a more nuanced picture. The Wikipedia page on the article has good links on this. Most new programmers shun goto because they have been warned it is evil, bad, and wrong rather than a more considered opinion. My GCSE students learn structured C++. I myself am a CS grad and was a professional programmer a number of years ago. Why do you learn about bits and bytes if modern languages, with good reason, abstract from it? Why do we learn to program in assembler if modern languages, for good reason, abstract from it? Why do we learn bare-metal imperative programming if object oriented languages, with good reason, encapsulate it? Why do we learn C even though C++ offers much better ways to express ourselves? Why do we learn naked pointer semantics if smart pointers are the way to go? It helps to know goto when you learn about loops, and what they do for you. The same way it helps to know molecules if you try to understand a cell. 1 It is also important to understand that machine independence and structured programming and object orientation are essentially concepts which are just more or less supported by the different languages. You certainly can write well-structured assembler. OO crept into my C after I grokked C++. Don't teach it if you want Programmers (know what they're doing). Do teach it if you want Computer Scientists (know why they're doing it). Obviously these two aren't mutually exclusive, but plenty of people learn how to code without understanding what they're doing at a lower level, and that's ok. If that's your goal, ignore goto; they'll never need to know it. If you do want them to understand the why, then you have to teach it. If their code uses any sort of control flow, then at a lower level something somewhere is calling a goto (or something close), and CS students need to understand how that works. The exercise to translate an arbitrary flow diagram more or less mechanically into a jump-less one, however, is not to be recommended. Then the resulting flow diagram cannot be expected to be more transparent than the original one. I know most of us have focused on the goto side of this question, hopefully this sheds some light on the flowchart side as well. This line also reads to me as a confirmation that goto should be learned as a concept, since describing a control flow is nearly impossible without it, but Dijkstra still advocates avoiding it in code. I think the goto is sorely maligned. When Edsger Dijkstra wrote his famous letter in 1968, high level languages were not the same as they are today, and the goto could easily be abused. In my early days learning FORTRAN IV, the goto was an important part of the language and many of the important modern structures were not yet universally mainstream. The resulting code could indeed lead to a degree of complexity which would be hard to analyse. High level languages were meant to be more abstracted than machine languages, and you would have thought manually encoding the structure this way was a failure in this regard. If that sounds like a strong argument against goto, then, well, it is. However, things have moved on since then, and the alternatives are not always better. In fact the goto is still there in spirit every time we use the switch statement in c-type languages, as it is all but a specialised goto. This explains why you then need to end each part with a break statement. Modern languages tend to restrict the use of goto to minimise the damage it could do in the past. In particular, you can’t just arbitrarily goto anywhere, but it must be within the limits of the current block, and only to labelled, not numbered, locations. If you add further self-imposed restrictions such as only going forward, or only using it in certain circumstances, it can certainly be used in an orderly manner. You can exit a function early with a return statement or a loop early with either continue or break. There is no standard early exit for an if block, but a goto to a label after the block will do nicely. For testing and trouble-shooting, it may be useful to skip earlier parts of the code and go straight to the section in question. Wrapping these earlier parts inside an if block simply to skip them is counter-intuitive and unnecessary. The point is, every programming structure has its pitfalls and can be abused. goto has possibly been more abused than the others. However, there is still a case for using it in well-controlled circumstances, as it can help make the code easier to follow. So yes, there is value in teaching goto. As regards flow charts, I think that they remain the most obvious way of visualising a process. The fact that they are used so often in non-technical contexts attests to this. When teaching programming I often end up drawing arrows all over the structures. I’m not sure that I would take flow charts too formally, though. They are useful in visualising, but I certainly don’t think they’re necessarily the best way to plan a program. I teach them within assembly code. Otherwise, I mention them within my Java class when I teach their modern-day analogues, break and continue. This is late in my AP course, after the AP test is over. I present the two statements as restricted versions of JMP (that's the 6502 Assembly syntax for goto), and I then follow up with two questions. They get to discuss it out in small groups before we rejoin as a class and go over it together. This gives them a chance to discover through peer discussion how language restrictions can really ultimately help us. Why, do they suppose, does Java restrict our JMP capabilities to very specific situations? What would be the problem with giving us an unhindered jump command in Java? Flowcharts are a useful tool to understand programs that perform moderately complex sequences of interactions. They aren't always a good way to describe an algorithm, but they are a good way to describe the behavior of a system that reacts to external events in different ways depending on its state, with a non-linear control flow. Note that by flowchart, I'm not referring to a specific formalism — at this level of detail, I might as well call it a state diagram (although a proper state diagram requires a more precise understanding of what the different system states are before you can draw it). Flowcharts have their place in an imperative programming course, but only at a fairly advanced stage, after the students are familiar with basic control structures such as conditionals, loops and subroutines. They're a visual aid to understand complex control or data flow, in the same way that decision diagrams are a visual aid for complex series of conditionals. The only good reason I can think of to introduce flowcharts early on is if the students started with a style of visual programming that resembles flowcharts. Otherwise, teach while loops first. Goto is an instruction that's hard to really understand. (If you think it's just a jump, you don't understand goto.) It's perfectly fine to teach imperative programming without goto, if you're doing it at any level that's higher than assembly (in which case what you'd teach is jumps). Goto is very rarely useful in the real world and is rarely used. Its place in a basic or intermediate imperative programming course is as an incidental mention, as something that exists, that you mention for the students' interest but isn't part of the curriculum and won't be on the exam. Many coding standards for embedded programming forbid using goto for anything else. In languages that have a better clean-up mechanism, such as try/finally or C++ destructors, goto is useless. The real difficulty with goto is, as I mentioned before, that it isn't just a jump. It's a jump to a different context. The invariants that hold at the location of the jump may not hold at the target location. A goto introduces a non-local connection between two points in a program that makes it hard to figure out how the program state evolves and what invariants hold. Paul Powell's statement that “GOTO (…) is easy to understand” is just wrong. What's easy to understand is how a machine executes a goto statement. But the most important part, understanding how a program that uses goto works, is difficult. The statement that “it can be used to explain what loops and other items of structured programming actually are” also completely misses the point. Goto can explain how structured programming items are implemented on a processor. It explains an implementation, not the concept. Goto is an advanced step after structured imperative programming, not a step before. Using goto to encode flowcharts is also very misguided. With goto, “we can code directly from a flow chart” — this is true: goto makes it easier to write a program from a flowchart without understanding how the program works, without figuring out the structure in the flow of events. But when you do that, you end up with a write-only program. Sure, you've been able to write it, but you won't be able to explain its behavior when a parameter that isn't reflected in the flowchart turns out to be important, or to modify it in a way that isn't easy to draw on the chart. Write-only programming is the mark of a mediocre programmer, capable only to fumble in the dark until they somehow manage to pass the tests. Goto has its place when you teach how a machine executes code. It's what's happening under the hood. It has little to no place in teaching how to program, and Dijkstra would be quite right to complain about its use in this context. I teach a college level introductory computer science course, where the primary goal is to learn programming in Java with no assumed prior programming experience. I do teach flow charting when I cover decision making & looping. Flowcharts aren't a great tool for an entire non-trivial program. They are a reasonable tool for high level algorithm design and for code level representation of methods. Furthermore, most students have seen a flowchart of some type before & I find that any degree of familiarity is helpful to those who find programming to be an otherwise foreign concept. I need to reach as many of my students as possible & find flowcharts to be worth leveraging in that regard. I do not cover use of goto beyond stating that it exists, it's easy to misuse and typically by the time they might encounter it in a production environment, they should have accumulated enough programming acumen to deal with it as needed. It's not a core piece of the language & there's plenty of other material that sees more routine usage that could use its time. The real question here seems more like when should you teach goto rather than if you should teach it. A while true construct is more sensible here. However, if you introduce your students to programming by demonstrating the low-level operation of the CPU (fetch/decode/execute) then it's more likely that you'll need a force-pc (although typically it also needs to be conditional). The assembly language constructs typically don't quite match high-level languages exactly (e.g. count down rather than up, in a loop to allow compare-and-branch-if-zero), but at some point your course will probably link high level languages to machine operations. rather keep the templates simple and expand the linguistic elements progressively. while (TRUE) is just a compound keyword when it's first needed, just like GOTO <LABEL>. It should be easy to explain that modern high level languages are designed so that humans can understand the code. That is why there are usually several different ways of expressing control flow even though to a beginner they all look interchangeable. In the absence of any more specific reason, goto is likely to come at the end of your list of 'possible control flow changes' and probably needs to be introduced as an instruction which has been mostly replaced in modern programming, because other constructs are better, not simply because goto is bad. The best reason I can think of for introducing goto is that the concept might help when it comes to explaining hardware interrupts (being the most important part of CPU architecture which isn't even mentioned in far too many courses). I will concern myself mostly with goto, but first a little on flow charts. 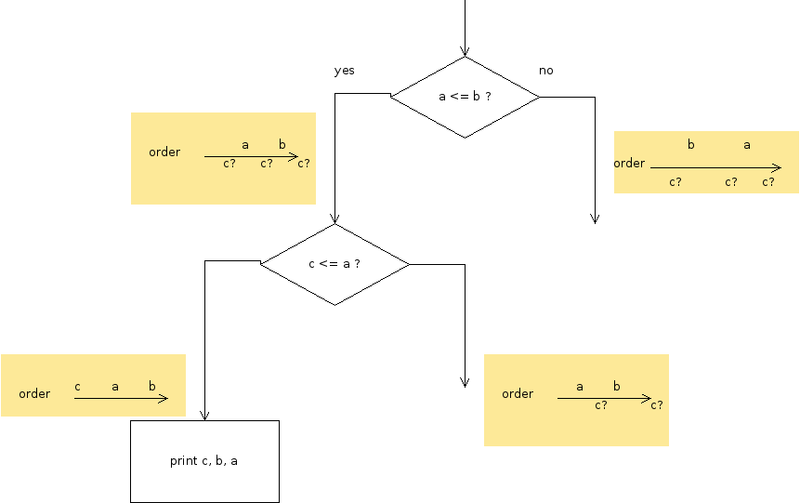 I see flow charts as just a ways to visually represent goto-ful low-level algorithms/code. Some other answers have mixed up their use with state-machines, or decision trees. Doing this could result in coding each code path separately, this would result in an undesirable increased program-size. For example for a sorting algorithm, of we could get a code size complexity of $O(n!)$. This does not scale, much beyond sorting 3 items, and you will use all of you computers memory (just for the program to sort 16 items). The low-level nature of flowcharts can be of great value, when creating a procedure to be carried out by humans. I.e. A first aid flowchart. In the paper “Go To Statement Considered Harmful”, Dijkstra is concerned with the goto statement, not with goto. He points out that all higher order structures will use goto in their implementation. According to Dijkstra, this implementation is not the problem, only the direct use of goto. In the time since his paper the structure he mentions, if, else, while, for, until, repeat, and sub-routines have been part of our high-level languages. For his call was not for us to stop using it in programs, but to create languages that did not require it, and then to stop using it. And in the meantime to use it only in a structured way, to simulate the structures. Therefore only use it if your language does not provide the high-level structure that you need, and know which structure you are simulating (don't ad-hok it). Programming in assembler, though you should not have much assembler language in your project. Compilers/generators: These will use goto to create higher-level structures. To over come limitations of the language, but consider changing language: In C you may use goto to implement exception handling. However ensure that you have a clear idea of the structures that you are implementing. Do not use goto in an ad-hoc way. When goto can seem like a good idea. goto is easy to understand, how it does it. However the code that you create (beyond the most trivial) is not easy to understand what it does. That is our attempts to understand a large system, in terms of how it works in a dynamic way, are going to be very limited. However it is possible to view the system in a static way, and thus make it easier for our brains to comprehend. To do this we must let go of a little of the how. We do not seem to have a problem with this in most cases: we care not how print is implemented. So our CPUs use goto (jmp instructions). So what, unless you are teaching assembler language and CPUs. But do all CPUs use goto? Possibly not, I am not an expert on this. However here is a discussion on what modern CPUs think of goto/jmp. That happens when a modern (instruction pipelined cpu), fetches a conditional jump instruction? All is not well, first it tries to guess which way the branch will go, then it goes that way. If it get it wrong it hits the brakes, backs up and tries again. The circuitry in the x86 for making this guess, is huge. The x86 does not like goto. What about the ARM, its branch prediction circuit is tiny (if it is a branch back, then assume that the branch will be taken, else assume that it will not), The ARM is better at predicting branches than the x86, but how? The arm has more conditional instructions, that is, it has selection built in. This allows it to avoid goto a lot of the time. Its simplistic algorithm then assumes that a jump backward is a loop, and a jump forward is a selection. So though iteration is not explicitly encoded, and selection is only sometimes explicitly encoded. This shows that knowledge of the programs structure is not just a high level thing, it can help the CPU's performance. As Miles says it showed no benefit of flowcharts. But also not it was year 1977, and they were fortran programmers (goto users). It may be that if the experiment was repeated with the control group using structured programming, that the effect may be negative. However making the first step easier will make all subsequent steps harder. Someone once said, “Never hire any one that knows basic. They will have been so irreparably damaged by the experience of gotos, that no amount of re-rehabilitation can save them.”, while I do not agree with this statement, there is some truth in it. Could it be used when teaching for, while, if, etc. As opposed to as a way to program. Therefore, only teach goto, when teaching assembler language, or at a late stage in high-level programming. However first teach the higher level structures, and make it clear that goto is only a work around for lack of higher-level structures in the language. And consider its use in teaching structured programming. goto is not bad per se, it depends the way you use it, that's the way Dijkstra and other papers should be read. It can be very useful to simply get out from inner loops without creating weird boolean conditions. Of course if you use it to produce spaghetti code, that is bad. which is much much better than using boolean condition to exit from the loops one-by-one. I doubt anyone would consider such usage as bad, in really helps reading the code which would be much more difficult with a mess of strange combinations of conditions. Naturally flowcharts illustrate the jumps in between portions of code and this can be simply implemented with jumps. After all an if necessitate a unconditional jump. Beginners have sometimes difficulties to understand what exactly happens in construct like if, while, etc and ask "what code is executed after that", saying that a jump exists from the end of a block to the beginning of another one is a good way to explain, much more than a purely syntactic explanation. Exercise: given three numbers a, b and c, print them in ascending order. The student is expected to articulate a lot of comparisons, and quickly gets lost because his/her brain can't handle 6 cases and the necessary tests at the same time. So some intermediary representation is needed to work on it. Say, I obviously have to compare things. Let's start with a comparison of a and b. On one side, I know a is bigger. On the other side b is bigger. What else ? A graphical representation helps to work on the decision tree, much more than a textual representation if embedded if-then-else. Image of work in progress. 1 of 6 cases solved. Extending the diagram can be done on any order. Yellow boxes show what I know about the order in some case. c? means : "c could be there". This control flow cannot be implemented with only control flow structures (if, switch, while, for, do while). You have to either use a goto after one of the conditions, or bend up another structure to simulate it. The latter naturally results in code ranging from slightly weird to awful (loops that don't actually loop, infinite loops with if+break conditions in the middle, artificial flag variables which form some kind of state machine, one-off functions that don't actually represent a stand-alone operation...). The truth is that control flow structures do not cover all possible cases. goto should always be the last ever tool you try to solve a problem, but you shouldn't throw it away from your toolbox lest you want to end up driving a screw in with a hammer. There are a lot of answers here about flowcharts, and the author's answer seems centered around grade-school students (as that is what his article was about). However, there are in fact some instances where we professionals do use gotos. We don't like to talk about it, because they have such a bad rep. However, if you crack open the code for most of the world's lexical analyzers you will find gotos. Lex itself generates gotos (admittedly, as do many other automated source code generators). Gotos are in fact the natural expression of a state machine. It is meet and right to try to train students to put more structure into their programs than a simple state machine. However, there are a few tasks that in fact do not have more structure to them than a state machine. A lexical analyzer is one of these tasks. The typical goto-less method to work around this is to create a variable to hold the state, and write a big honking switch statement embedded in a loop with little or no code between them. That works, and avoids using the g-word, but it doesn't really gain anything. Rather it just hides the unstructured control flow under an artificial layer of structure. (Note: gotos are also commonly used in languages that don't have exception handling, but that's arguably a separate issue). Then one of two things are going to happen: Either there was a properly structured way to write the same code, and I'm going to grade you just like you wrote "goto" there, or there isn't, and I might dock you a point or two for the extra obfuscating of not using goto. Also, courses like Compiler Construction that naturally entail gotos should mention this issue, and not hide from it. flowcharts are useful to communicate and document the logic of a process. Not knowing how they work may well be a problem in some kinds of work. goto has value in many situations where some programmers (not all) will work. Not everything is done in high level or modern languages. At a low level on most processors there are no loops, only conditional and unconditional gotos (branches). Older non structured languages also remain in use. goto also has considerable importance in security/vulnerability. That's because hacking and vulnerability work (and therefore security) can involve understanding stack manipulation techniques and disassembly (machine code to assembler) which are completely based on jumps not loops. If you look at an infosec analysis of malware you'll see the need to comprehend code that doesn't have high level classes and objects. Not the answer you're looking for? Browse other questions tagged flowcharts goto or ask your own question. What can Snap! do that Scratch cannot? Is there any value in teaching pseudo code?